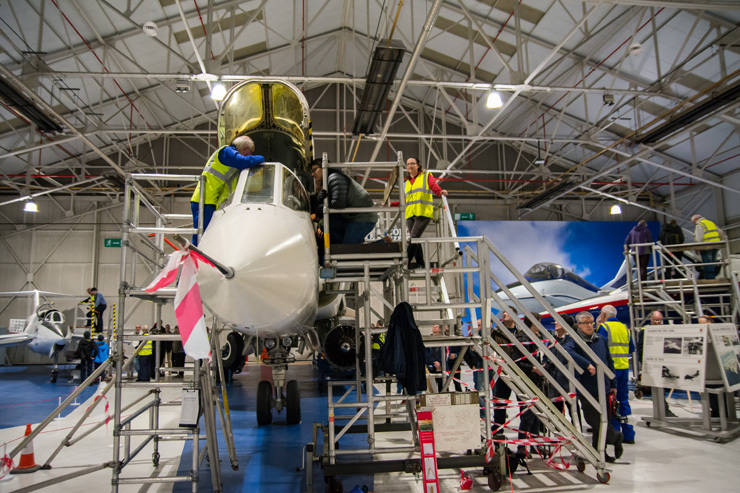 2018 sees the 100th anniversary of the formation of the RAF, numerous events have been planned across the country to mark this landmark achievement. 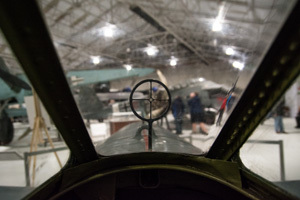 Both sites of the RAF Museum (London and Cosford) are offering visitors the rare and exciting chance to get a closer look inside 100 cockpits and vehicles from their collections. 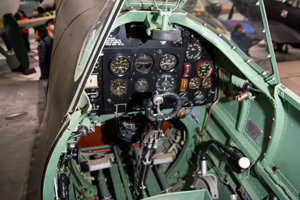 The first of these Open Cockpit and Cab events took place on February 9th at the Cosford site. Tickets were limited to just 300, so it was no surprise to see this event sold out in advance. 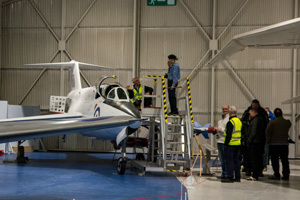 The event started at 6pm and allowed visitors 3 hours to view 12 different cockpits and cabs throughout the two hangars that were open. The Cosford site is the proud home to four themed hangars full of rare, unique and historically significant aircraft. 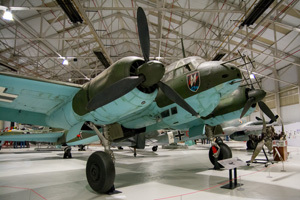 This event focused on the ‘War in the Air’ and ‘Test Flight’ hangars, both playing host to many exhibits that cannot be seen anywhere else in the world. 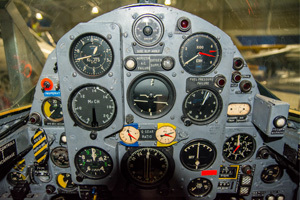 Although a strictly observed policy of limiting the time in the cockpits made it possible to get around most of the display items during the 3 hours, I felt it prudent to prioritize the exhibits I most wanted to see first. 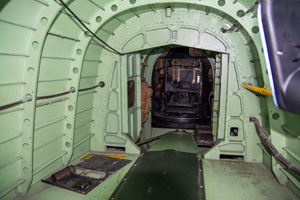 Therefore, upon arrival I made my way straight to the Avro Lincoln to climb onboard and glimpse inside the fuselage towards the cockpit. Based on the Lancaster, the Lincoln first flew in 1944 and remained in service post-war until eventually becoming outmoded by the incoming jet aircraft of the early 50s. 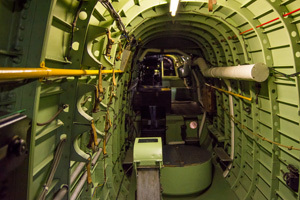 Although the Lincoln itself was just too late to see World War Two service, once inside one could not help but feel echoes of the 55,573 Bomber Command crewmen who lost their lives during the conflict. 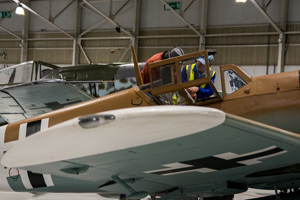 Elsewhere in the hangar the Supermarine Spitfire Mk1 and its arch-nemesis the Messerschmitt BF109G were open for close viewing, allowing a unique chance to compare these two old foes from the inside. 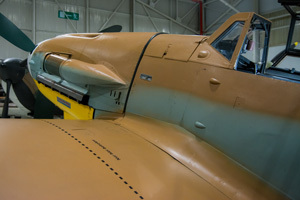 Cosford’s Spitfire is the oldest surviving example of RJ Mitchell’s most-famous creation, where as the BF109 here is a slightly later example, so any direct comparisons are perhaps a little unfair. The Messerschmitt may look familiar to any veteran airshow attendees as ‘Black-6’ made many appearances prior to its crash landing after the Autumn Duxford airshow in 1997. 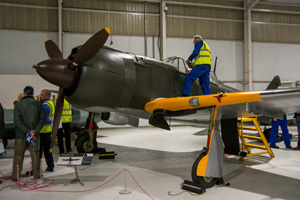 The recent arrival of the Boulton Paul Defiant, Gloster Gladiator and Junkers Ju88 from the Hendon site has really bolstered the ‘War in the Air’ hangar at Cosford. Naturally though, it is the opened exhibits that attract the most attention with the rare Kawasaki Ki-1001b attracting large crowds all evening. Meanwhile, I could not resist seeing the world through the eyes of a WW2 Japanese suicide bomber by taking a seat (in the thankfully static!) Yokosuka MXY7 Ohka. 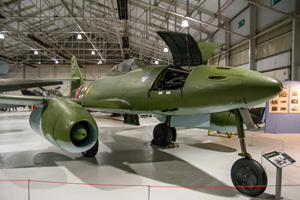 The equally infamous ME 163 Komet was also open for public to sit in. Cosford’s ‘Test Flight’ hangar holds an equally mesmerizing collection of unique aircraft from the English Electric Lightning prototypes of the Shorts SB5 and EE P1, to the ill-fated BAC TSR2. The later of which was also open this evening for close inspection. Other unusual displays here include the supersonic research aircraft the Fairey Delta FD2 which visitors were able to sit inside and try to imagine what it would have been like to lead the glamourous and down-right dangerous life of a test-pilot in the early 50s. The FD2 is noted here for having a drooping nose to allow pilots a better view when taxiing; a feature later adopted by Concorde. 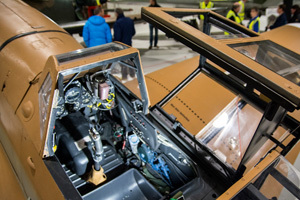 Visitors were also able to climb inside the Saunders-Roe SR53 and SPECAT Jaguar ACT demonstrator both of which played a key role in the development of British aviation. The Hawker-Siddeley Kestrel was perhaps one of the most popular aircraft on display today having directly led to Britain’s aviation crowning glory; the Harrier Jump-Jet. Each cockpit visit was accompanied with a live tour from one of the numerous volunteers, each of which had boundless enthusiasm and excellent knowledge (often first hand) of these aircraft, which added a depth of realism to the event.